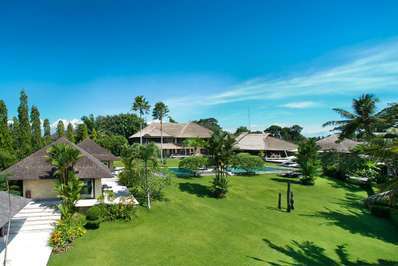 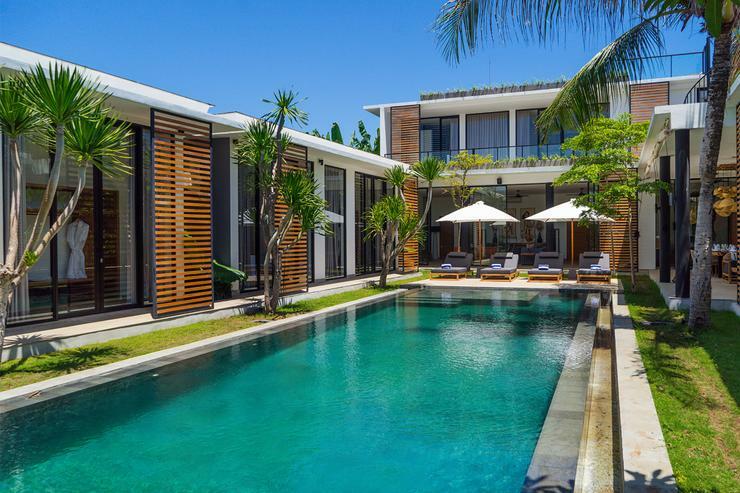 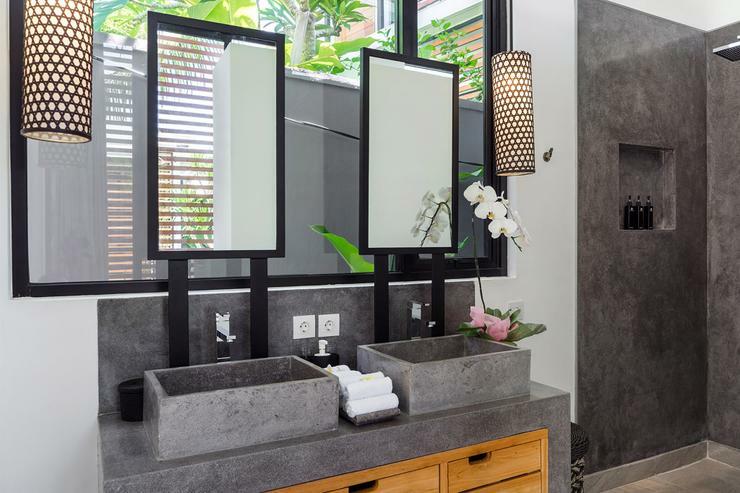 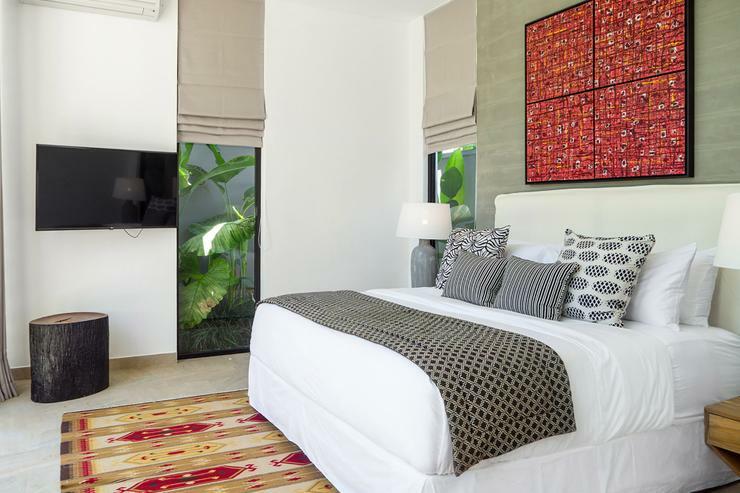 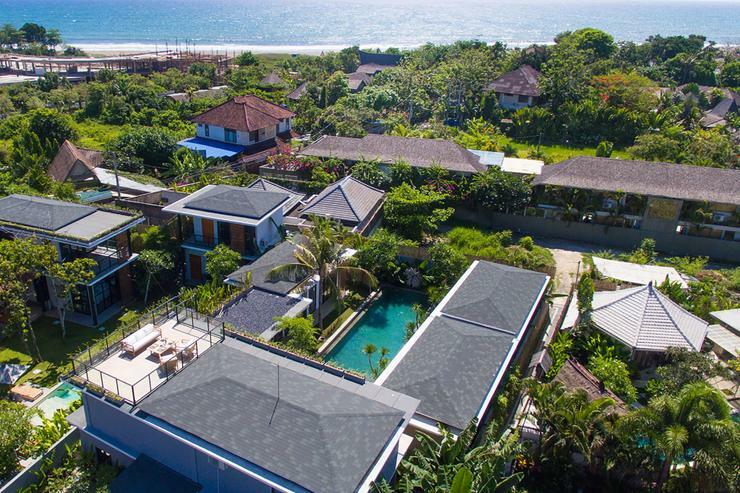 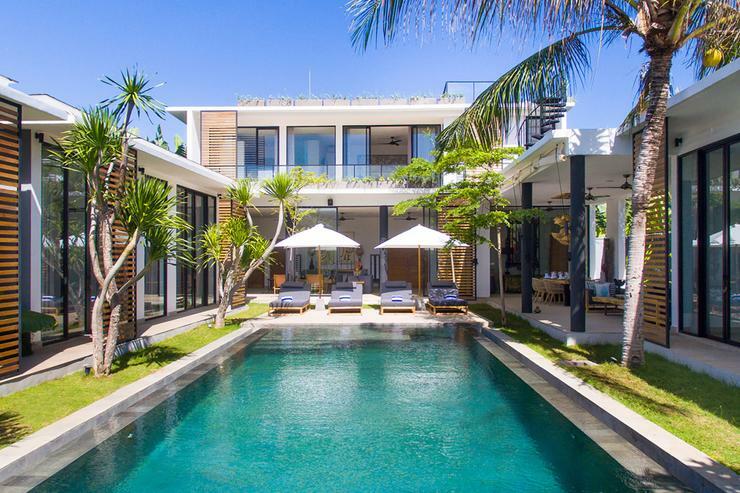 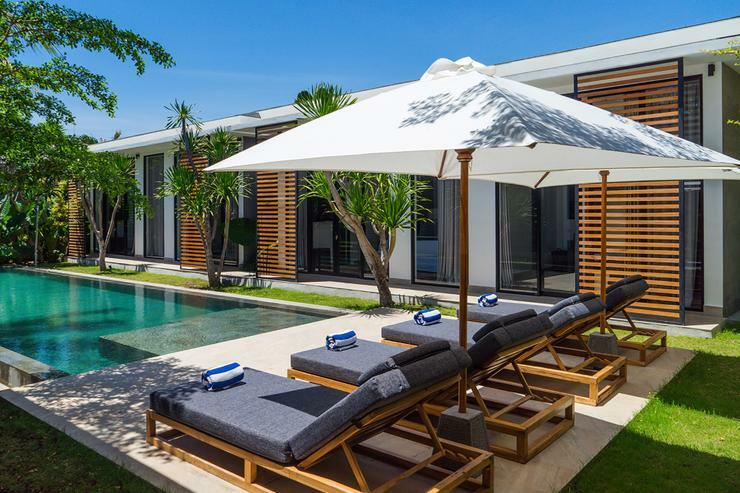 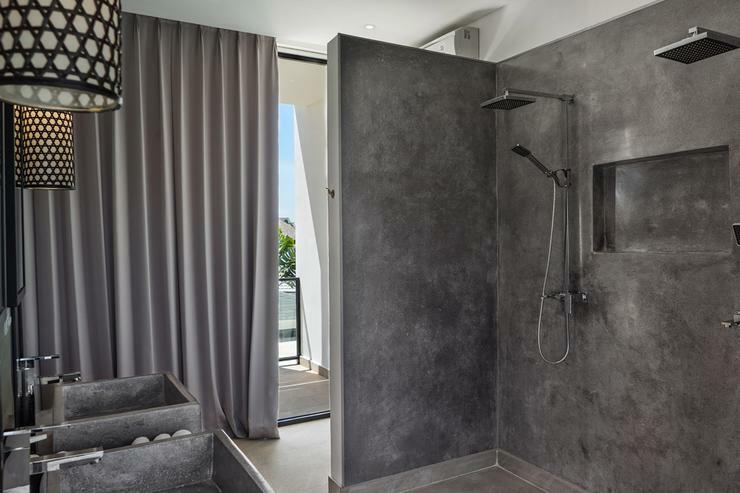 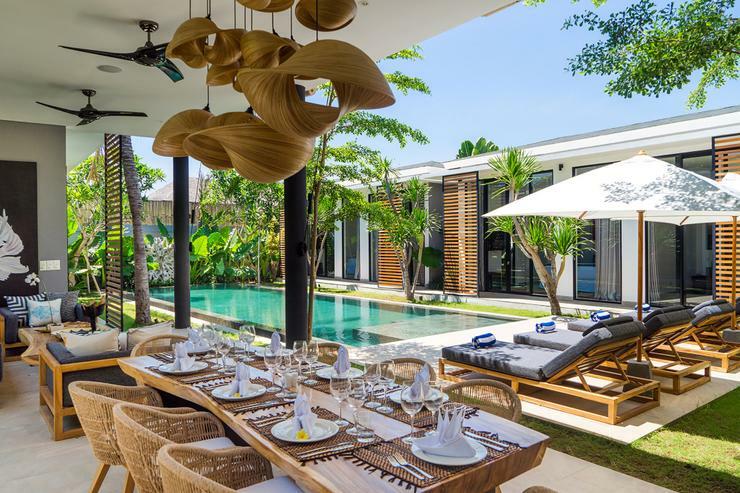 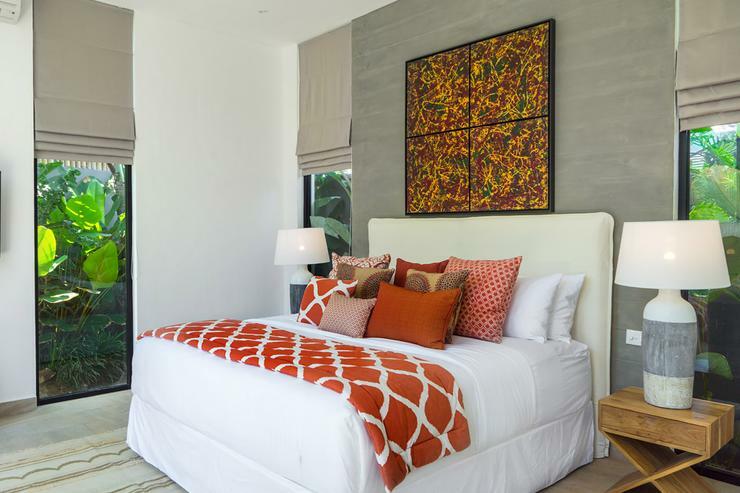 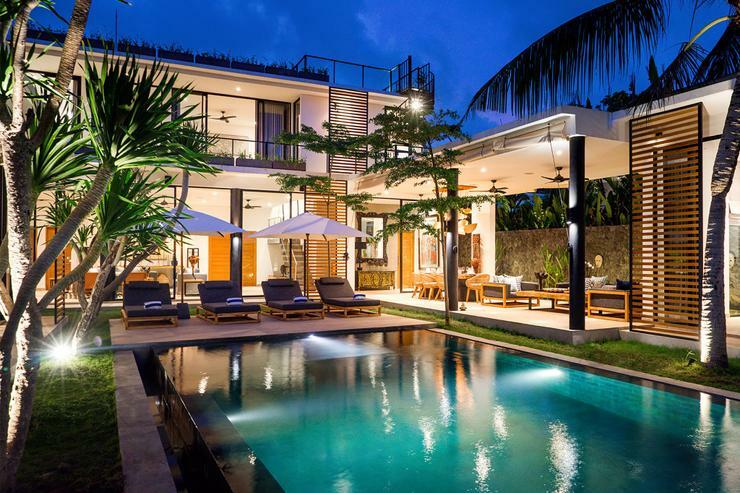 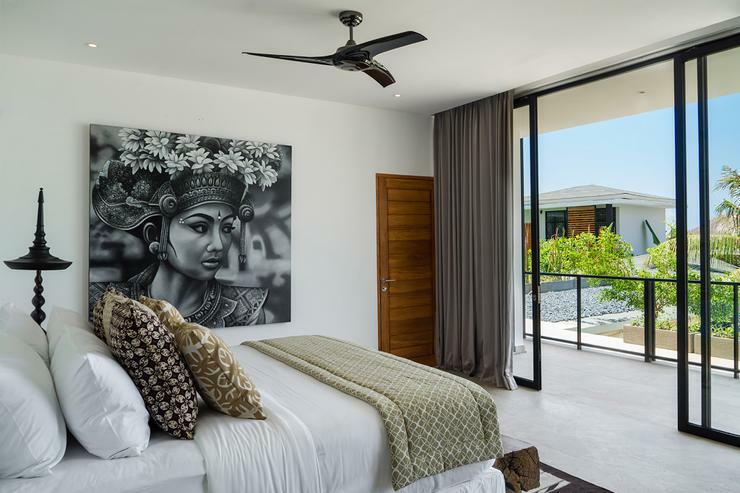 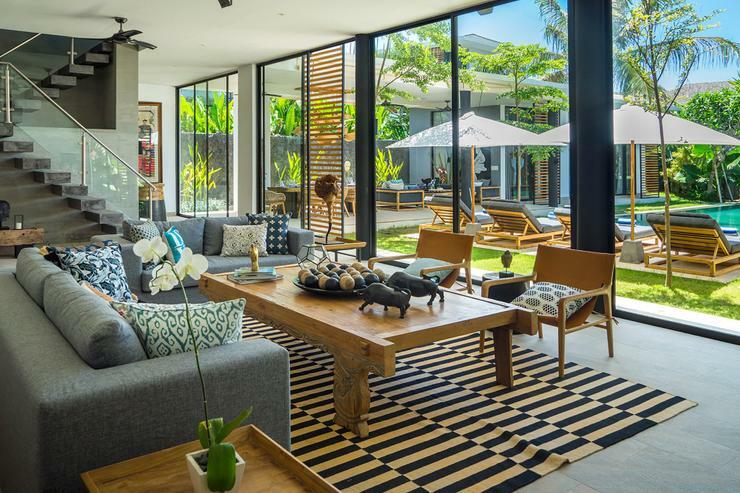 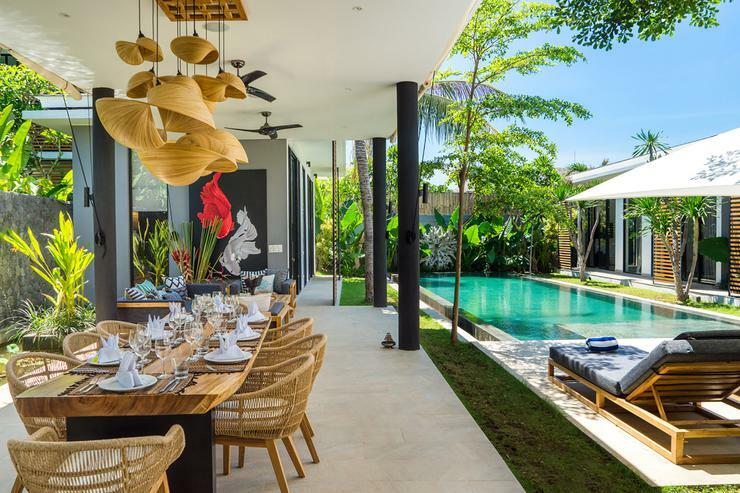 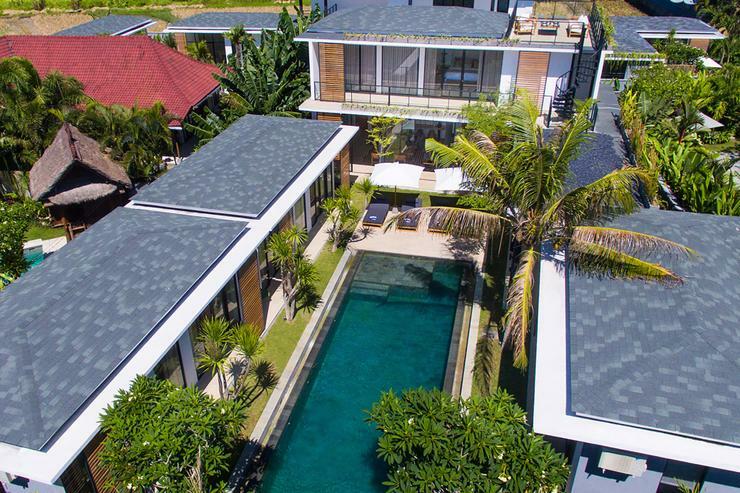 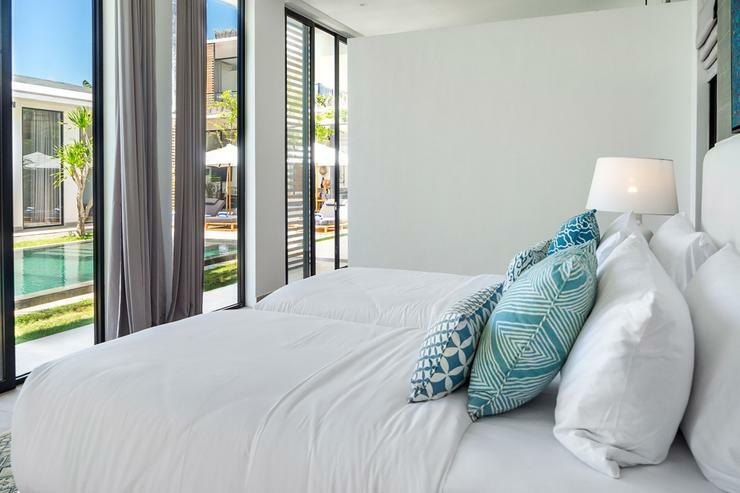 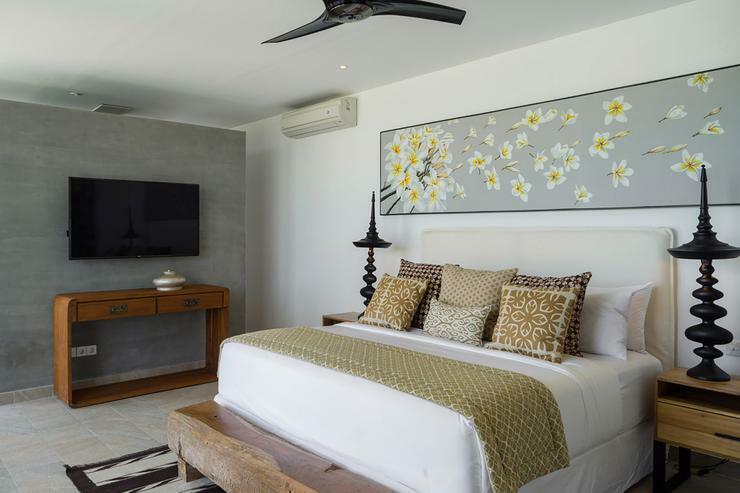 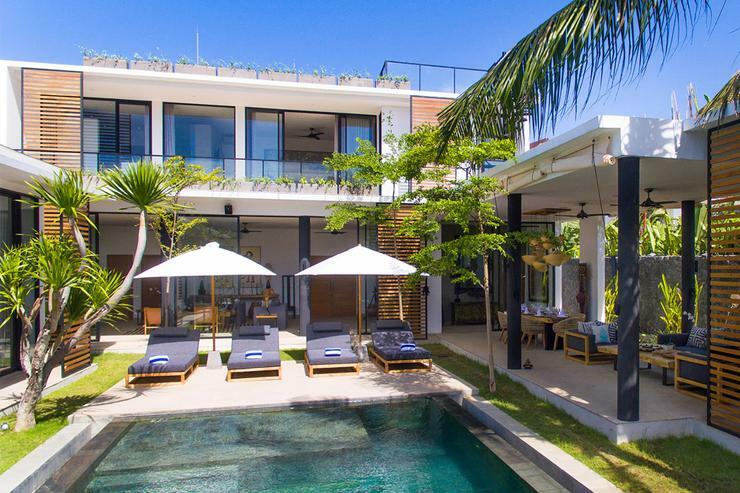 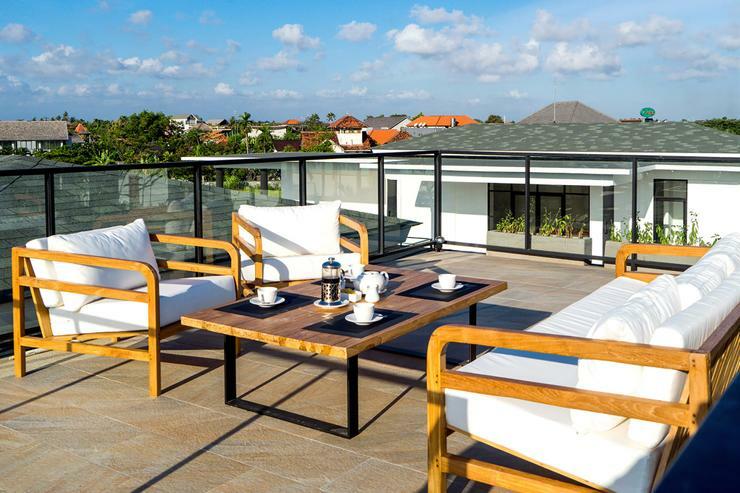 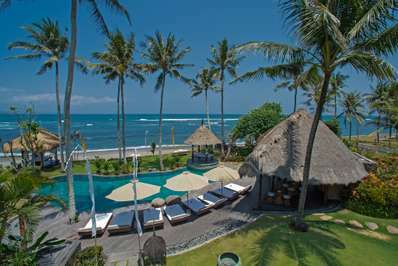 Villa Vida is located in the village of Berawa on the border between Canggu and Seminyak. 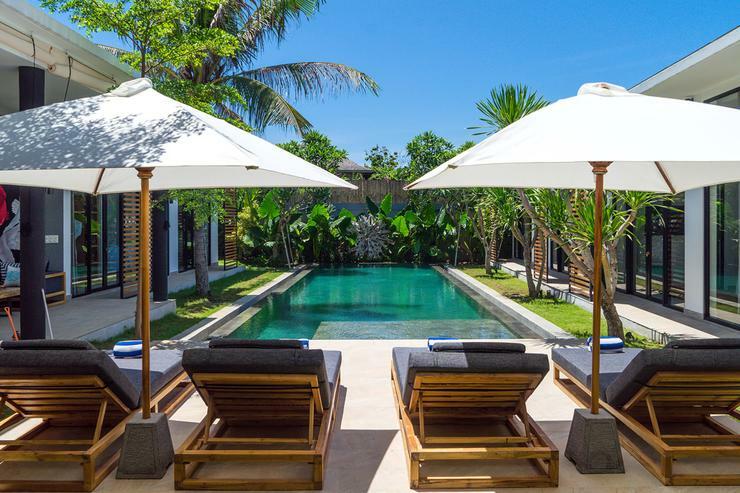 Berawa is rapidly becoming a hotspot for surfers who enjoy riding its long beach break, as well with foodies who revel in its dazzling number of coffee shops, delis and restaurants, and shoppers who will enjoy browsing the many boutiques in nearby Canggu. 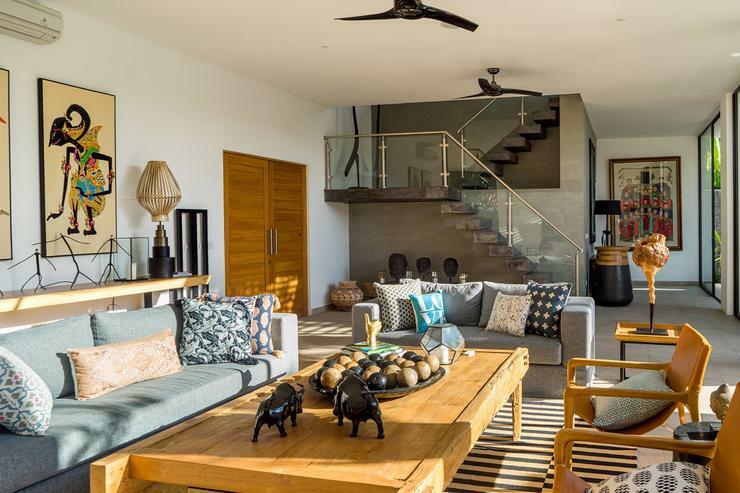 A staircase from the lounge goes up to the first floor with its master bedroom and large terrace. 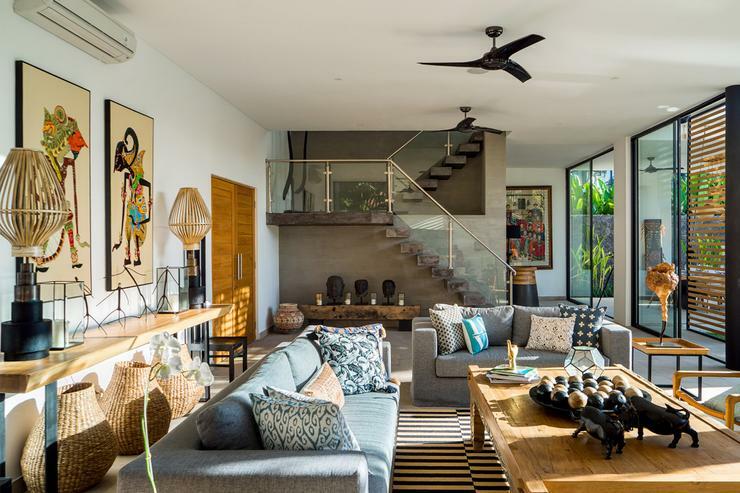 A second staircase leads to the roof terrace. 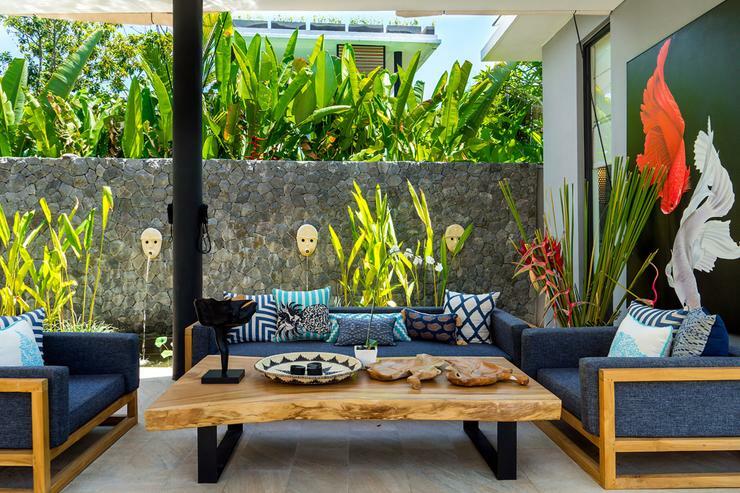 Beyond the lounge to the left is a beautiful outdoor dining and seating area, along with one of the guest bedrooms. 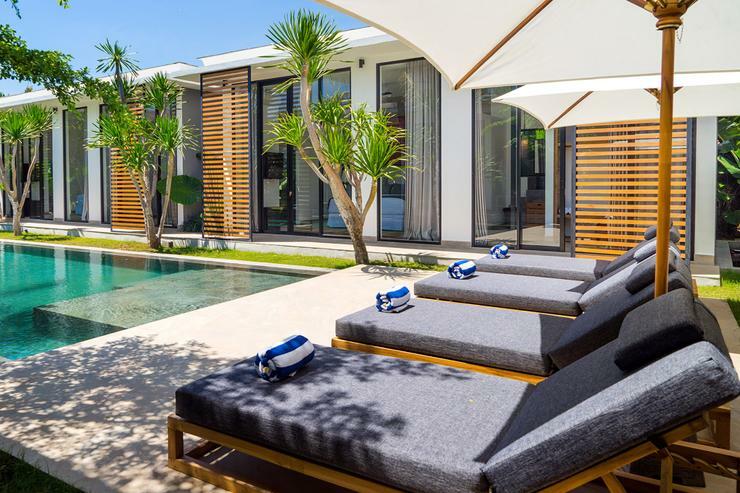 The other two guest bedrooms are on the right-hand side of the pool, separated from each other by a small patio garden. 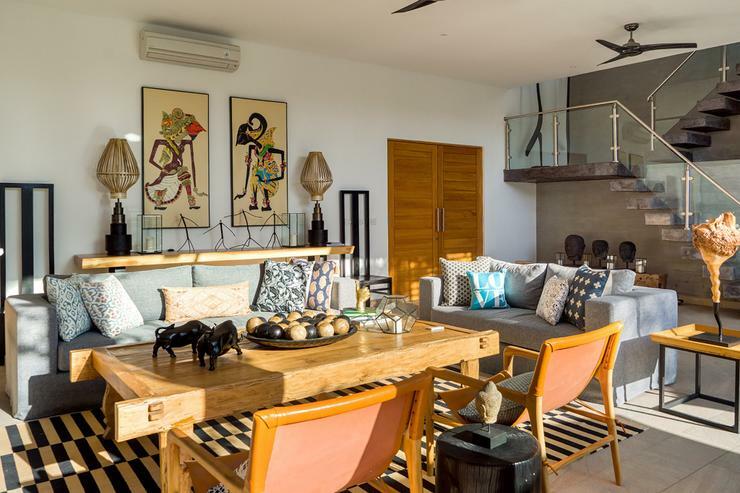 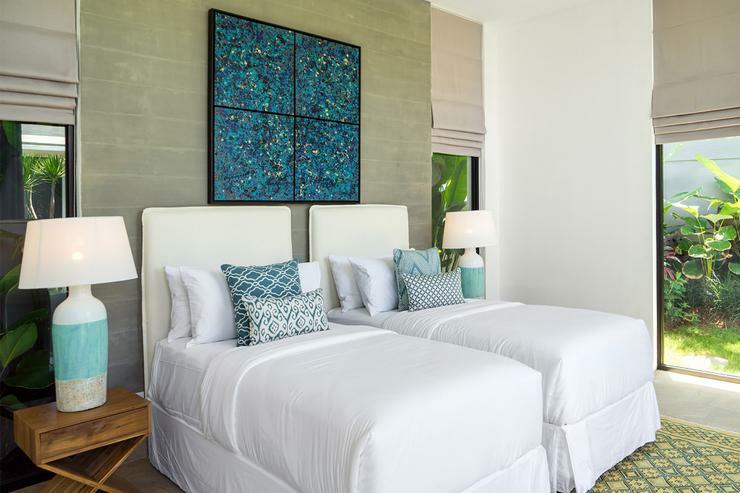 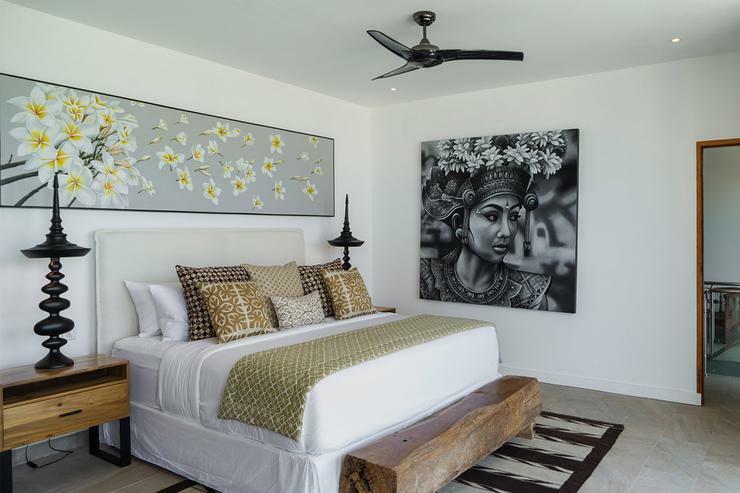 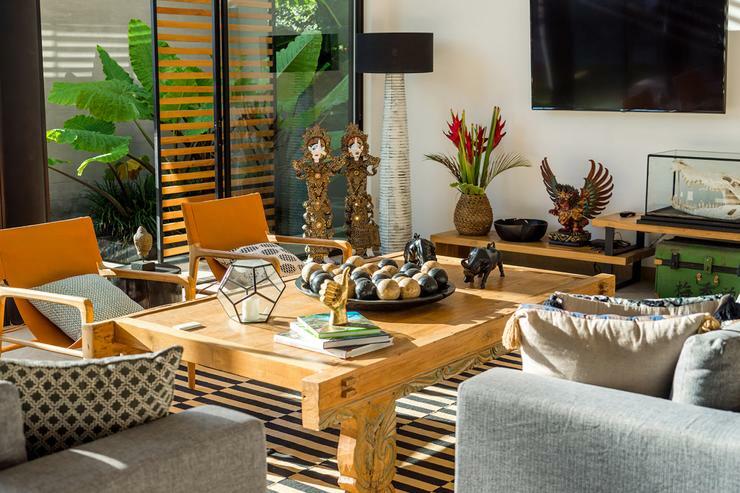 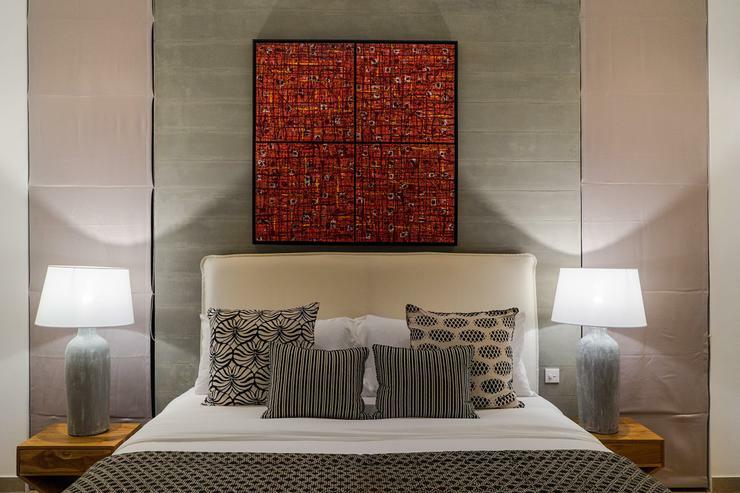 Villa Vida’s lounge is furnished with comfortable sofas and features floor-to-ceiling windows and a fascinating collection of art pieces, including a number of authentic Balinese and Javanese antiques, which perfectly complement the villa’s minimalist theme. 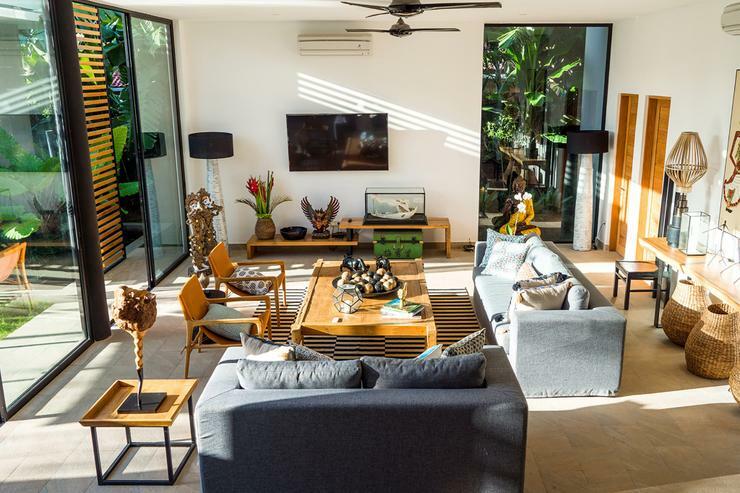 Adjacent to the lounge is a separate kitchen with all mod cons, including a wine cooler. 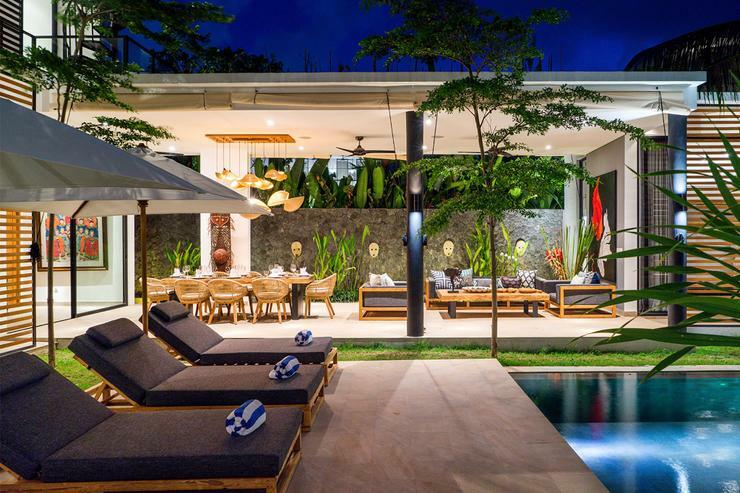 Vida’s poolside layout gives the villa a real ‘Malibu’ feel. 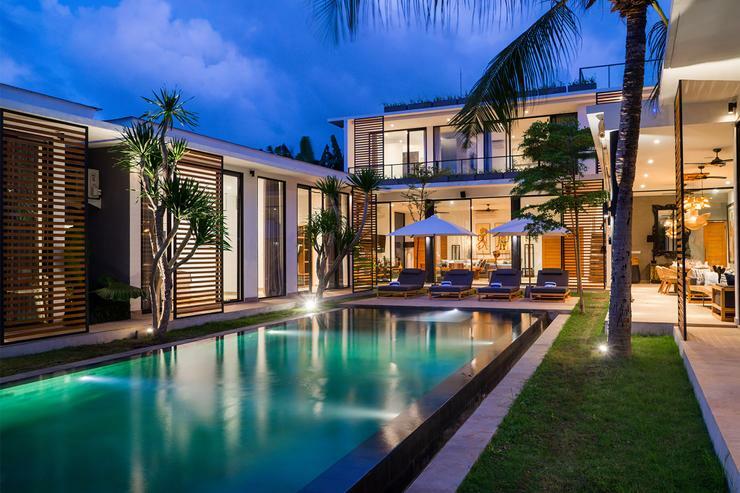 Windows look out either to the pool or the lush green foliage of the garden. 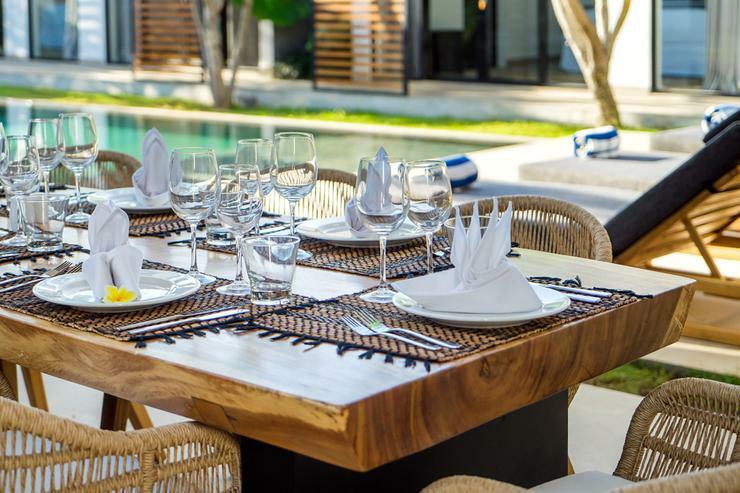 The water feature in the outdoor dining area provides a calming vibe throughout the property. 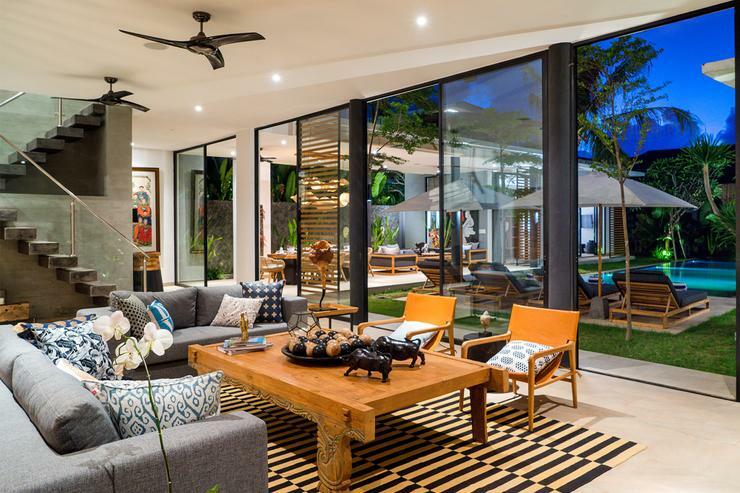 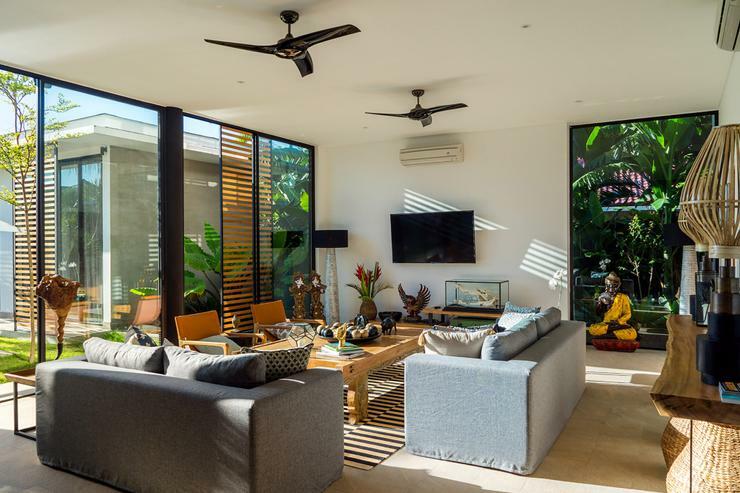 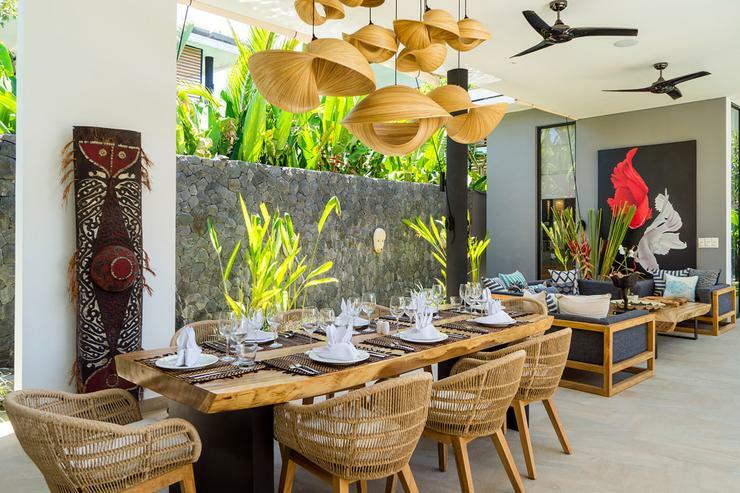 The outdoor living and dining space is a real showstopper with its dark volcanic stone wall, huge tropical leaves and massive painting featuring Japanese Koi Carp. 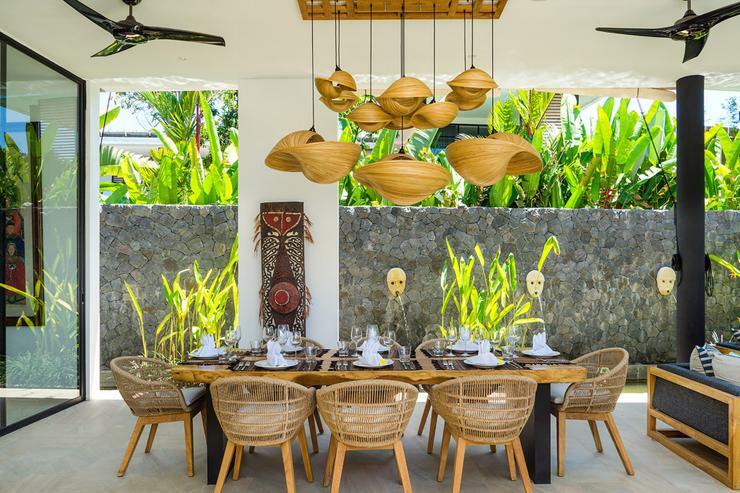 This a wonderful spot for hanging out with loved ones or for enjoying a meal at the large solid wooden dining table. 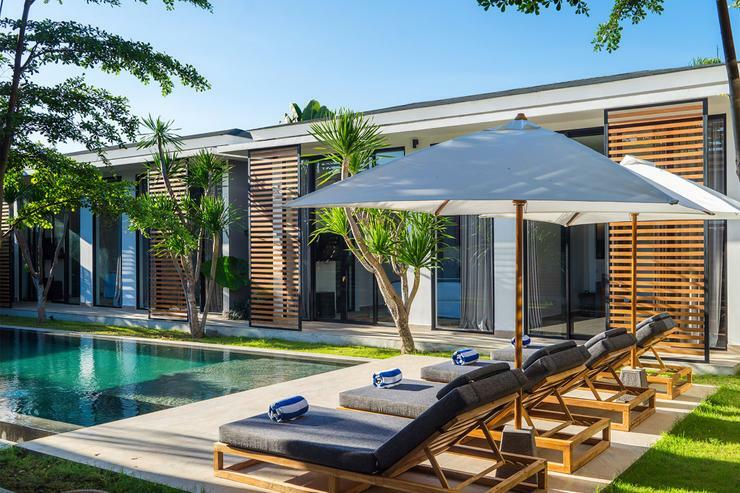 The 15 x 4-metre private pool has plenty of sunbeds – great for topping up your tan or enjoying a freshly made cocktail. 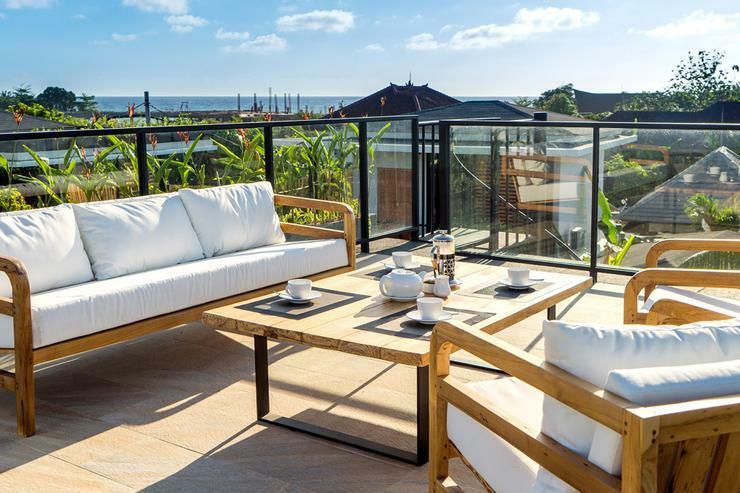 You’ll also enjoy a bird’s eye view of the ocean and the surrounding rice fields from the private rooftop terrace on the second floor.